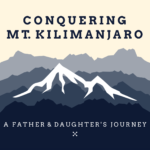 In September 2018, Fred Walk and his daughter Allison climbed Mt. Kilimanjaro, located in Tanzania, Africa. On Thursday, April 11 at 5:30 pm, you’re invited to hear how they prepared, executed, and successfully completed their journey to the “Roof of Africa.” Fred and Allison will share the many twists and turns of their adventure, which originated at 7,000 feet in the lowland rainforest, included traversing through six ecological zones, and culminated in reaching the alpine summit of 19,341 feet. This program is part of Towanda District Library’s National Library Week celebration. Refreshments will be provided, and the library will remain open beyond its typical hours to highlight this featured program. Fred and Allison exemplify our National Library Week mission, “Libraries = Strong Communities,” and we look forward to hearing the story of their remarkable achievement!